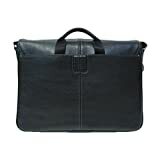 We have hand-picked a selection of best selling BOCONI messenger bags. Learn more and compare prices. 200-2207 Color: Coffee with khaki Features: -Includes plane ticket pocket, biz card pocket, pen/pencil slots, and key ring security snap. -Updated classic will help you organize your daily business and streamline your travels. -2 Leather top handles with antique nickel hardware. -Adjustable shoulder strap made from durable seat-belt material. -Neatly wraps around you like a messenger bag. -Backside pocket with hidden elastic cell phone pocket. Product Type: -Briefcase. Primary Material: -Leather. Top Loading: -Yes. Laptop Compatible: -Yes. Closure Type: -Zipper closure. Gender: -Men's. Maximum Laptop Size: -15.4". Removable Shoulder Strap: -Yes. Dimensions: -Sized perfectly to fit your 15.4" laptop. Overall Height - Top to Bottom: -11.5". Overall Width - Side to Side: -16". Overall Depth - Front to Back: -2". Strap Length: -54". Overall Product Weight: -3 lbs. 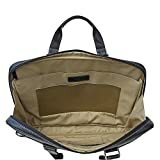 203-2301 Color: Brown Features: -Tricked-out with a padded laptop sleeve that fits most laptops up to 15.6''.-Durable seat-belt material used for our shoulder strap that glides over your clothes effortlessly.-Piggy-back panel on the backside to slide over your trolley handle that is guaranteed to stay securely in place.-Exterior D-ring for carabineers.-Piggy-back back pocket.-Quick-grab tab pocket for mobile phone on back panel.-Front pocket organizer panel.-Plane ticket pocket.-Business card pocket.-Pen / pencil slots.-Key ring security snap.-Double magnet closures assure 'quick-as-that' in / out access.-Interior organizer with three iPod / MP3, ear-bud, calculator and stuff panel pockets.-Plaid stamped feet to keep the bottom of your bag protected and to stand up.-Available in Black or Brown. Color/Finish: -Soft diesel-washed leather is accented by the distressed biker-leather trim. 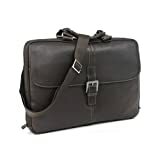 Dimensions: -Laptop dimensions: 11'' H x 15.25'' W x 1.5'' D.-Dimensions: 12.5'' H x 16'' W x 3.5'' D.
This Tyler Tumbled Mailbag Messenger from Boconi is a leather slim bag, perfect for your laptop. Padded laptop sleeve. Front pocket organizer panel. Double magnet closures. Interior zipper pocket. Adjustable shoulder strap. Top carry handle. Slim, stylish design defines a versatile messenger bag crafted from finely textured leather. 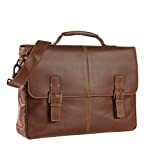 Style Name: Boconi Tyler Leather Messenger Bag. Style Number: 5667968. Available in stores. Durable canvas forms a leather-trimmed messenger that fuses vintage charm and professional appearances. 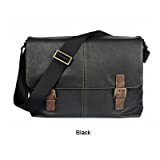 Style Name: Boconi 'Bryant' Messenger Bag. Style Number: 830970. Available in stores. 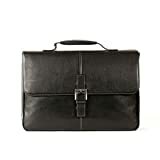 The Becker Vintage Luxe RFID Buckle Messenger from Boconi is a leather briefcase with space for your laptop and tablet. The padded laptop sleeve is designed for most 15 inch laptops. Interior organizer panel has RFID protected pocket, two pen holders, business card pocket, two extra pockets, and a clip for keys. Supple leather construction enriches a compact messenger bag featuring an array of interior pockets to keep you organized on the go. One of the exterior pockets has a zip-out bottom so it can be used as a strap to attach to the handle of a carry-on for added convenience. Style Name: Boconi 'Becker' Leather Messenger Bag. Style Number: 5212542. Available in stores. 233-9517 Features: -Backside piggy back zipper panel; easily slided over wheeled luggage. -Boconi houndstooth linings mixed with khaki canvas. -Boconi signature plaid embossing details. 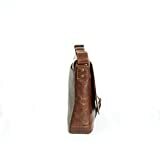 -Detachable shoulder strap lined with sleek seatbelt material. -Double rope padded top handle; superior comfort with strength to spare. -Front panel pocket organizer panel; includes plane ticket pocket, biz card pocket, pen/pencil slots, and key ring security snap. Product Type: -Briefcase. Color: -Antique Mahogany. Primary Material: -Leather. Water Resistant: -Yes. Top Loading: -Yes. Laptop Compatible: -Yes. Closure Type: -Flap closure. Gender: -Men's. Maximum Laptop Size: -17". Removable Shoulder Strap: -Yes. Dimensions: Overall Height - Top to Bottom: -12". Overall Width - Side to Side: -16". Overall Depth - Front to Back: -4". Overall Product Weight: -2 lbs. Supple leather construction enriches a compact messenger bag featuring an array of interior pockets to keep you organized on the go. An exterior strap allows it to be attached to the handle of your carry-on for added convenience. Style Name: Boconi 'Becker' Leather Messenger Bag. Style Number: 5212543. Available in stores.